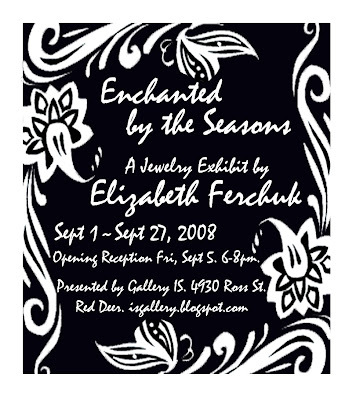 Gallery IS presents its newest solo show, "Enchanted by the Seasons". This exhibit is the first ever solo by local jewellery designer Elizabeth Ferchuk. Her work will be featured in the Gallery from September 1st to September 27th, 08. We hope you will make a point to come and see this unique display of custom made, sculptural beadwork. The seasons and all their glorious colours, both in nature and the ones traditionally associated with them, are what provided the inspiration for Elizabeth Ferchuk’s first solo show, Enchanted by the Seasons. From a simple flower in her backyard garden, a shimmering fall landscape, snow-capped trees or the summer skies at midnight, nothing is off limits to providing ideas. She finds that all the wonderful colour combinations provide such inspiration, that it’s quite an enchanting feeling when a design is thought up and begins to come to life. The pieces in the show are a mix, some are simple and eloquently stated and others are quite sculptural and expressive. " We are now accepting submissions to "Tryptic's", our next group show. This show is themed for artworks that come in a set of three. It could be three pieces, with a subject running through all, or it could be three pieces with related subjects. We are open to interpretation, but it must be 3 seperate works to be considered a Tryptic. Professional, emerging, and student work will be considered. We are only accepting one submission(one set of three) per artist for this exhibit. The deadline for submissions to the "Tryptic's" group show is September 20th, 08. Notice of acceptance will be given by September 22nd, 08. Delivery of accepted artwork must be made by Saturday, September 27th/08. Official show dates are September 29th to October 25th, 2008. Opening reception is Friday, October 3rd, 08. 6-8m.